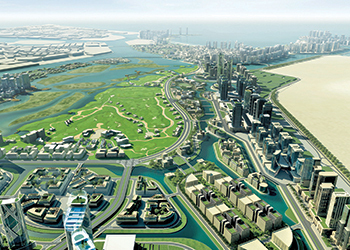 Al Zorah ... $544m development under way in Ajman. Mega real estate projects in the Northern Emirates are keeping the construction industry in good health, writes MRIDULA BHATTACHARYA. The construction sector in the Northern Emirates, comprising Sharjah, Ajman, Ras Al Khaimah, Umm Al Quwain and Fujairah, is gaining momentum following a number of new project launches. With the launch of mega projects like the Sharjah Waterfront City, Tilal City, Shoumous Residential Complex, Al Rayyan mixed-use project, Sharjah is undergoing major transformation. The new developments aim to address demand for both affordable as well as upscale housing in Sharjah. The projects will also enhance the position of Sharjah as an attractive tourism and investment destination. Sharjah has been witnessing huge growth in demand for real estate due to budgetary increases and upgrading of its transportation infrastructure, according to a report by real estate consultancy Cluttons. “The pace at which we are seeing the emergence of world-class masterplanned communities such as Al Zahia and Tilal City is setting the benchmark for future master-planned communities,” the report states. While the scale and pace of development is slower than Dubai or Abu Dhabi, the emirate is “blazing a trail in the creation of affordable upscale developments that are designed around the emirate’s rich Islamic heritage. This in itself is allowing the emergence of a niche residential market that caters to families who have been priced out of other markets in the UAE and those that have been waiting for more affordable communities in surroundings that echo their more traditional lifestyles. Sharjah is developing communities that people want to be a part of”. The Sharjah Investment and Development Authority (Shurooq) an independent body set up to boost Sharjah’s social, cultural, environmental and economic development, recently unveiled master-planned communities and mega projects, including the Sharjah Waterfront City (see separate report). Sharjah Waterfront City, a freehold waterfront project with 36 km of coastline, is expected to be the largest commercial, residential and tourism development project in the emirate, with a total area of around 60 million sq ft. The project consists of 10 islands interconnected by canals and features villas, apartments, offices, hotels, a water theme park, marine clubs, parks and other amenities. It will be developed in stages, with Phase One expected to be completed by Q3 2018. Earlier this year, Shurooq announced the launch of Al Noor Island, a massive leisure island project that is located in Khalid Lagoon. Valued at Dh80 million ($21.8 million), the island will consist of a Butterfly House that will house 500 species of butterflies, a Literature Pavilion, a children’s playground and an egg-shaped OVO art sculpture. The project will also include a pontoon, a docking space for boats that will transport visitors of the emirate’s existing tourist destinations such as Al Qasba, Al Majaz Waterfront and Heart of Sharjah to other places and eight art sculptures by some of the world’s most renowned artists. There will also be a bridge to link the main entrance with the island, which will enable visitors to walk through the 3,500-m Al Noor Walkway and tour the different attractions and facilities of the island. Sharjah currently has leisure projects such as Al Qasba, Al Majaz Waterfront, Al Montazah – Amusement and Water Park, The Flag Island and Heart of Sharjah. Shurooq also plans to invest Dh5 billion ($1.6 billion) in tourism development projects by 2018. Marwan Bin Jassim Al Sarkal, CEO of Shurooq, says about Dh500 million ($136 million) has been allocated for the development of Sir Bu Nuair Island, Dh300 million ($81.7 million) for Kalba Eco-Tourism project, Dh450 million ($122.5 million) for Al Jabal Resort — The Chedi Khorfakkan, and Dh120 million ($32.6 million) for Al Bait Hotel in the Heart of Sharjah district. Other projects include the development of Al Hisn Island, a leisure and tourist attraction located in the town of Dibba Al Hisn on Sharjah’s east coast. According to Shurooq, the plans for the resort are inspired by the Islamic architecture of Andalusia in Spain. Al Hisn Island will offer entertainment, restaurants, landscaped areas and children’s play areas. Shurooq is also planning a two-phase development of Khorfakkan’s corniche in conjunction with the Directorate of Public Works to create a world-class tourism and leisure destination. The masterplan includes a new hotel on the east of Khorfakkan beach, a water park and various other tourism and leisure attractions. Meanwhile, Al Zahia, a joint venture project of Majid Al Futtaim with Sharjah government, is coming up between Shaikh Mohammad Bin Zayed and University City roads (see separate report). As the first gated community to be launched in Sharjah, the project brings together contemporary community lifestyle and traditional values throughout every aspect of its development. The project will be home to more than 12,000 residents and span a total area of around 1.3 million sq m.
Comprising parks, children’s play areas, community retail facilities and the upcoming City Centre Al Zahia mall, the project offers spacious villas and town houses that cater mainly to families. There are also studio, one- and two-bedroom apartments in the succeeding phase of development. Tilal City is another mega project in Sharjah. As Sharjah’s first masterplanned community, it offers 1,855 land plots for development to UAE residents. The Dh2.4-billion ($653.5 million) project is located on Emirates Road, 10 km from Sharjah International Airport. Khatib & Alami is the architect on the project, which has allocated 45 per cent of the land to facilities such as green spaces, jogging and bicycle tracks, six mosques and education, retail and leisure areas. Split into five zones, Tilal City will occupy an area of 25 million sq ft and provide affordable housing for 55,000-65,000 residents in apartments, villas and town houses. Meanwhile, the Dh550-million ($150 million) Shoumous Residential Complex is being developed by Shoumous Properties, a partnership between the UAE’s Albatha Real Estate Group and MAG Group. Launched in February, the project is being promoted as the UAE’s first fully serviced gated community. Spread over 6.8 million sq ft with 220 residential plots, Shoumous will offer six different sizes of plots, ranging from 18,442-39,297 sq ft. The complex is situated in the Al Tai district of Sharjah, with easy access to the Sharjah Downtown area and airport. The complex will offer a multitude of services that will transform it into a self-contained community. The project will also include a commercial centre, three parks, two mosques and a hypermarket. Another Sharjah-based property developer, JMS Property Development and Management, is developing a mixed-use scheme known as Al Rayyan in the Al Nahda district close to the Dubai border. The Dh700-million ($190 million) mixed-use project will contain residential, commercial and retail units spread across a 2.7 million sq ft site. The developer says the scheme would be the first in Sharjah to offer leaseholds to non-GCC residents of the UAE. The project will contain two residential towers containing 504 apartments, one commercial tower and a retail complex. The top 12 floors of the commercial tower will also contain serviced hotel apartments and the mall will house a 204,500 sq ft hypermarket and 80 to 90 shops. The development will also house spas, landscaped leisure areas and 24-hour security. The residential and retail units are scheduled for completion by the end of Q1 2016, while the commercial tower will be completed to shell and core by Q2 2016. The project has been designed by B&H and is built by Terna Construction. As the fourth largest emirate in the UAE, Ras Al Khaimah has a number of integrated communities offering attractive high-end stocks at par with the developments in Dubai and Abu Dhabi, but at a fraction of the cost. Some of the projects coming up in the emirates include Mina Al Arab, a 165-million-sq-ft development built around a marina. Developed by RAK Properties, the project is due for completion by 2020. RAK Properties recently signed a hotel management agreement with Minor Hotel Group (MHG) to operate a luxury eco-themed waterfront resort: the Anantara Mina Al Arab Ras Al Khaimah Resort. The resort will be built in Mina Al Arab and have 250 guest rooms, suites and Maldives-inspired overwater villas. It will be situated in a secluded area with its own private beach overlooking an eco-reserve lined with mangroves. Among the amenities of the resort are speciality restaurants, health and sports facilities, ballroom seating and events area, kids’ club and spa. The resort will commence operations in late 2018. Marriott is currently developing a new five-star 300-key luxury beachfront hotel, which represents one of 20 properties currently under development in the emirate. The Ras Al Khaimah Marriott Resort, which is the hotel chain’s first property in the emirate, is expected to open in 2019. Meanwhile, Diamonds International Corporation (DIC) has launched a development featuring a five-star hotel, branded residential apartments and 40 water villas on Al Marjan Island in Ras Al Khaimah. Valued at Dh500 million ($136 million), the new development will have 340 branded residential units, while the five-star hotel will have 300 rooms and suites. Construction is slated to begin in early 2016 and will be completed in three years. The Al Marjan Island (AMI) Company has completed Phase One of the Al Marjan Island Corniche, which extends up to Al Hamra Village and creates a 3.5-km pedestrian and cycling track along the waterfront. The project links Al Marjan Island with Al Hamra Village through an additional track parallel to Sheikh Mohammed bin Salem Road. The Corniche features a circuit of running, cycling and walking paths located on the southwestern edge of the island, and connects the island’s entrance in the south with the proposed food and beverage boardwalk to the north. Al Hamra Real Estate Development’s expansion work at its Manar Mall in Ras Al Khaimah is progressing well with completion likely in the third quarter of next year. Once ready, the net leasable area in the mall will double to 60,000 sq m from the current 30,000 sq m. The Dh230-million ($62.6 million) development includes a waterfront retail promenade overlooking local mangroves and a new entertainment centre. Al Zorah Development Company, a joint venture between the government of Ajman and Solidere International, recently unveiled two new communities within its self-sustaining 5.4 million-sq-m Al Zorah development. The Golf Estates gated community is a combination of villas, townhouses and apartments set on the 18-hole Nicklaus Design Golf Course within The Fairways district while the Al Zorah Beach Residences comprises chalet-style villas and apartments in The Shores district, in what will be the country’s first residential property on the beach right next to a golf course. Al Zorah will cost 4544 million in the first phase, and forms an integral part of Ajman’s vision to transforming the emirate into a green economy that provides the best opportunities while preserving the environment. Meanwhile, R Hotels, the hospitality arm of Ajman-based R Holding, launched a Dh150-million ($40.8 million), 182-key hotel project at Ajman Corniche. The hotel is set to open in the first quarter of 2017.